Last week, I asked a controversial question on Facebook – and it had nothing to do with politics. The first reply came in a matter of minutes. Soon, a flurry of thirty responses and counterarguments were published. The question that provoked the outpouring: What traditional Thanksgiving dishes do you dislike? This Thursday, we’ll celebrate Thanksgiving in the United States. The holiday commemorates a feast in 1621 that was shared between pilgrims from England living in Massachusetts and the Native Americans. Even as a child, I figured that the pilgrims probably wouldn’t have survived but for the generosity of the Native Americans, who would ultimately not be repaid with the same kindness. But when you’re in grade school, you learn the folklore. You draw cornucopias with crayons. You make turkeys by tracing your hand on brown construction paper. The best part of Thanksgiving, though, was spending the national holiday with your family. And that could explain why debates over the dishes to serve at Thanksgiving can get heated. Families pass down their food traditions from generation to generation. First, it is true that not everyone has the same tastes. Second, cultural tastes evolve over time. Third, when families blend through marriage, another clash over the Thanksgiving menu often surfaces. And thus, the debate begins. What dishes should be served this year, and which dishes should remain in Thanksgiving pasts? Green Bean Casserole. Photo Credit SarahJane via Flickr. Green beans from a can are smothered in cream of mushroom soup and then topped with french fried onions. I loathe this casserole. I like fresh green beans. I don’t need to mask the taste. I hate the squishy sound this casserole makes when you scoop it out of the baking dish. Some of my Facebook friends felt the same way I do, but others stand by their casserole. And my college students? When I asked them in class, many were shocked that I cast aspersions on a most beloved dish. Why ruin Jell-O with carrots? As for the Jell-O variations with marshmallows, I don’t care for that combination either. The strangest Jell-O dish that I heard last week was topping the gelatin with cheese. No. Just no. The very first comment to my Facebook post was about beets. I don’t have an opinion because, apparently in my family, no one has ever cared for beets, so they weren’t part of our Thanksgiving tradition. Canned cranberry sauce. Photo credit Daniel Morrison. I wasn’t a fan of canned cranberries when I was a kid. My mom would serve it if we were going to have guests at our dinner who liked it. But it wasn’t a hit in my immediate family. While many Facebook friends agreed that canned cranberries had to go, there were those who said they grew to love and cherish the gelatinous red lump often still sporting the rings of a tin can. My thoughts about cranberries changed once I discovered how to make cranberry sauce from fresh cranberries. Canned sweet potatoes, lots of brown sugar and marshmallows are used in this traditional dish. It was also one that I didn’t like. And it was mentioned by a few of my Facebook friends as a dish that could be skipped. Cranberries and sweet potatoes are two foods that I have discovered are quite good fresh without so much processing or added sugar. And there are delicious ways to prepare this nutritious food that don’t involve marshmallows. My vegetarian friends mentioned that they love veggie side dishes – unless someone ruins it by adding meat or giblets to jazz it up. So, if you’re going to serve green bean casserole, avoid the temptation to add beef or bacon if vegetarians are joining your meal. For the record, I like turkey. And the part that I like the best is, admittedly, a bit gross: roasted turkey skin. However, there were a few friends who confessed that they don’t like turkey at all or don’t like either white meat or dark meat. Some haven’t made a turkey in decades. It was through this discussion that I started looking at alternatives to turkey. Some serve ham. Others may offer duck, pork or lamb. One option that I hadn’t thought of is fish. There are those who argue fish most certainly would have been on the menu at that first Thanksgiving. Are there traditional Thanksgiving foods you love or loathe? Are you serving anything new or nontraditional this year? I’d love to get your thoughts on this timely topic. 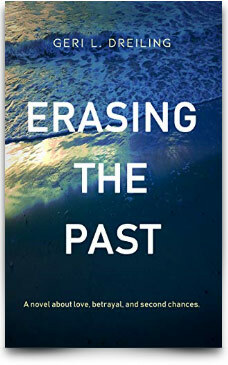 In other news, I’m pleased to announce that the revised and reimagined edition of Erasing the Past was just published on Amazon. I will have the book available from other booksellers shortly.